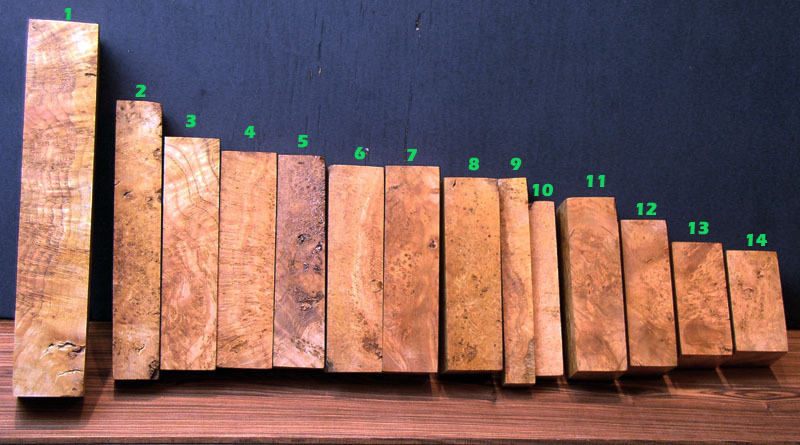 This is the exciting page for various figured woods that just don't fit somewhere else. We will have an ever changing inventory, and most are here because they are available only occasionally or just once. Usually there are not many pieces available, so if you like what you see be sure to buy what you want soon as they may go quickly. Read the whole description to get the facts on what is being sold, dried pieces will say "dried", stabilized pieces will say "stabilized" etc. Might be noted somewhere in the description or the item. 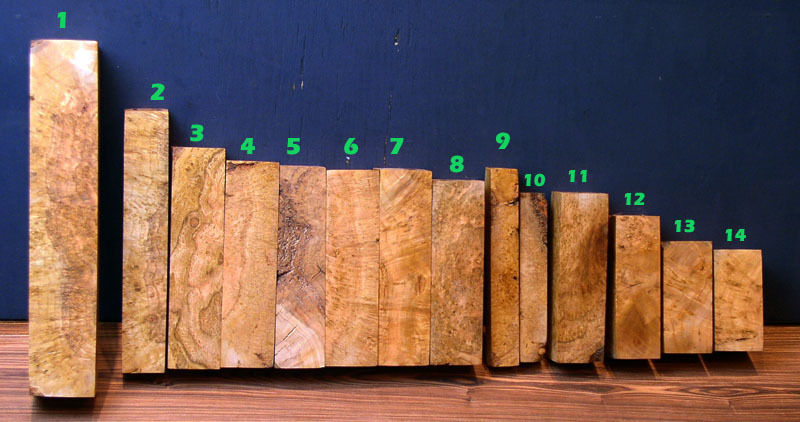 Gallery grade (gg) is a highly figured piece of wood. It has very high and intense figure on at least two parallel sides, or very good figure on 3 or 4 sides. Gallery grade PLUS (gg+) is a piece with rare intense figure that appears on all 4 surfaces of a square. Usually uncommon to rare. Click the photo for view of side 2. Most of the burls in this little group are not found for sale often. 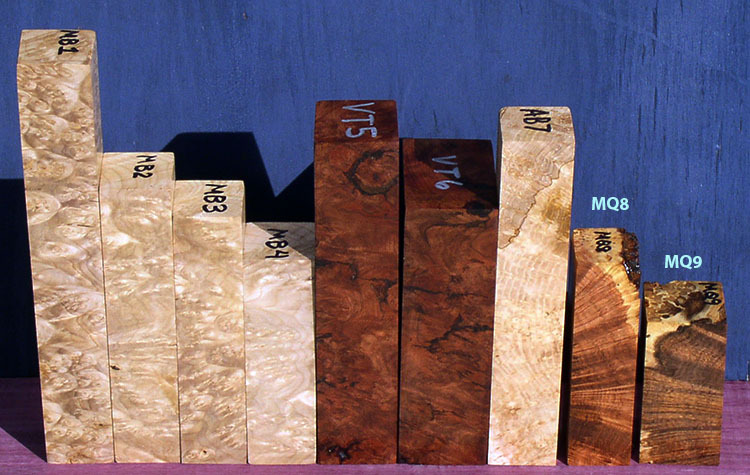 The Mulberry burl came from a single block of high quality that we dried since 2012. 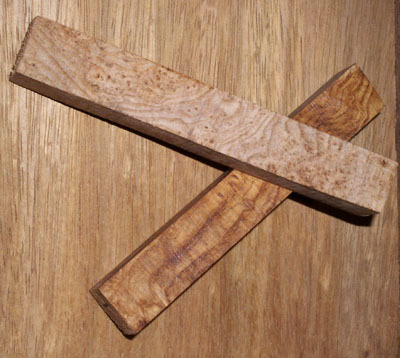 The mesquite are unique little pieces that had spalted burled sapwood on the ends and the Velvet Tamarind is a very rare burl from Laos, rarely seen for sale. 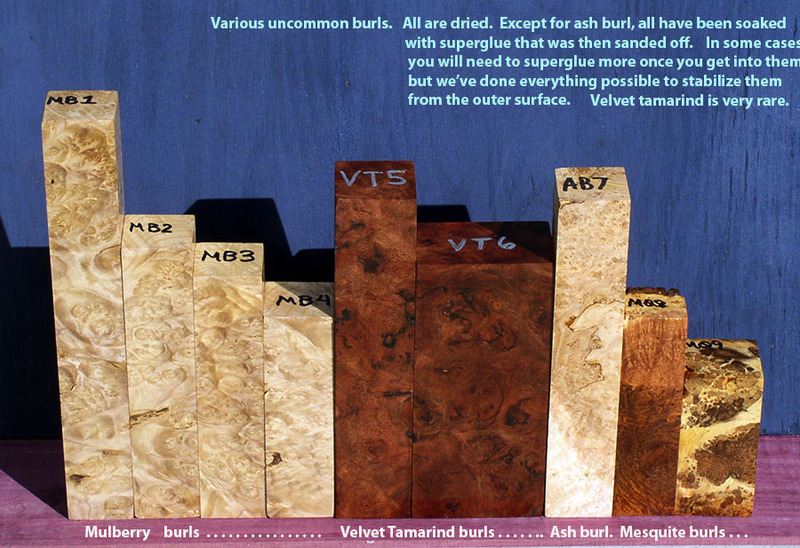 All of them except ash were soaked in superglue which was then sanded back off. PIECES missing below were already sold. 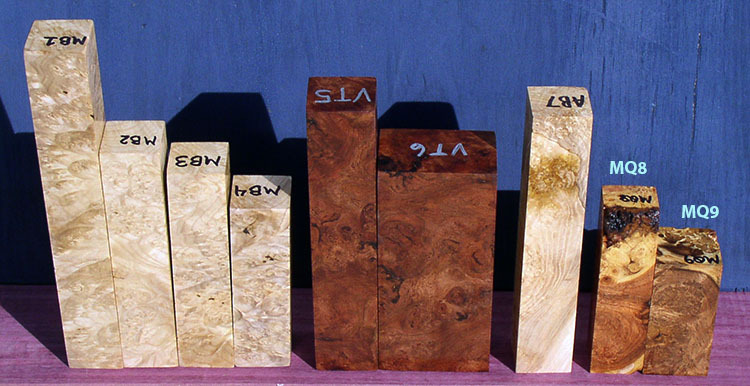 Stone Hopea burl is a very rare wood from Laos. 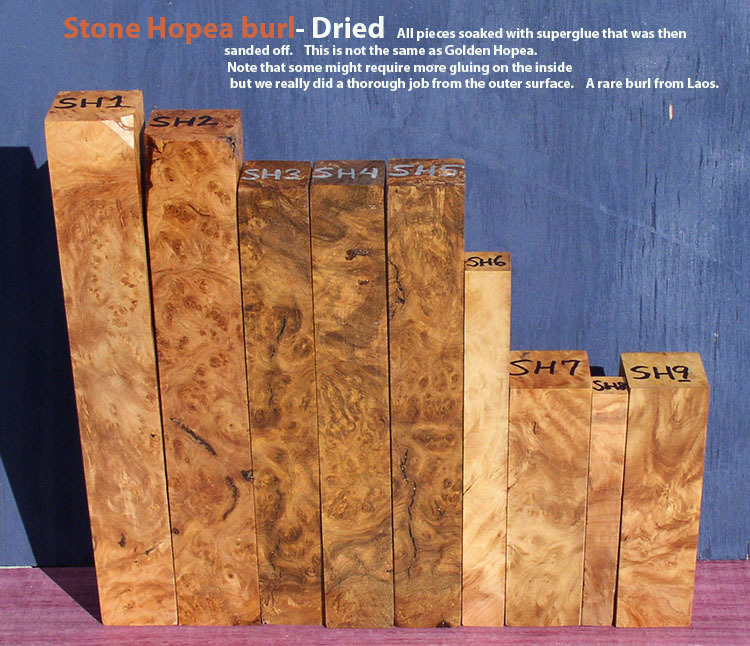 Note this is not the same wood as Golden Stone hopea which we also sell. They vary a bit in appearance with some darker, some lighter. In sanding the lighter ones, I was surprised at how easy they are to sand despite the incredible high density. 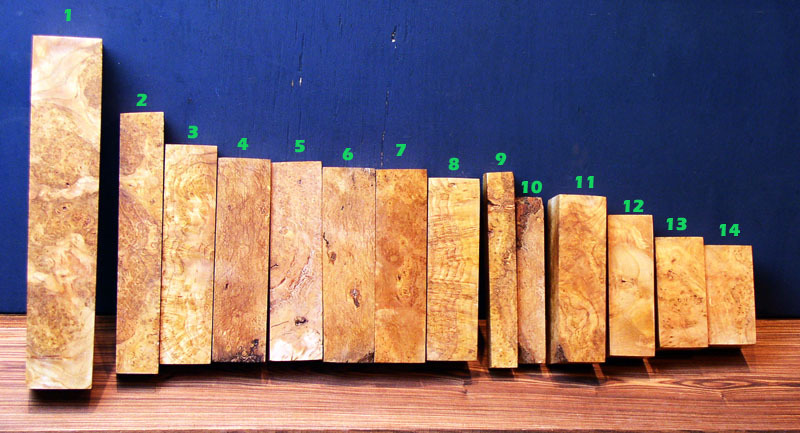 Reminds me a little of soapstone, and the feel of the wood after sanding is similar to soapstone, but not as slippery. All pieces have been soaked in superglue to fill any gaps. Some gaps after drying are to be expected in a burl this hard. Some people ask why we don't just have them stabilized instead of using superglue and the reason is: resin impregnation does not fill gaps. It just pushes plastic into the wood, which is good, but you still have all the gaps you started with after you are done. Pieces not listed below are already sold. 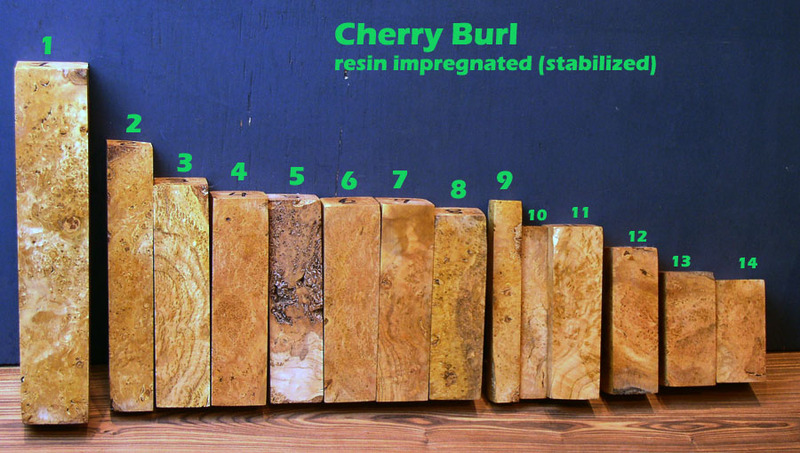 Black Cherry burl, resin impregnated. These were a highly selective cut to get this quality which is not typical. The burls are small meaning that even a 10 inch long piece is very hard to come by in this quality. Notes: Each piece has the grade on the item below. Piece 5 has some bark and small defects, high figure but half price. Pieces missing below are already sold. Just add them to the shopping cart-- The automatic discount will be shown as your price. different species. 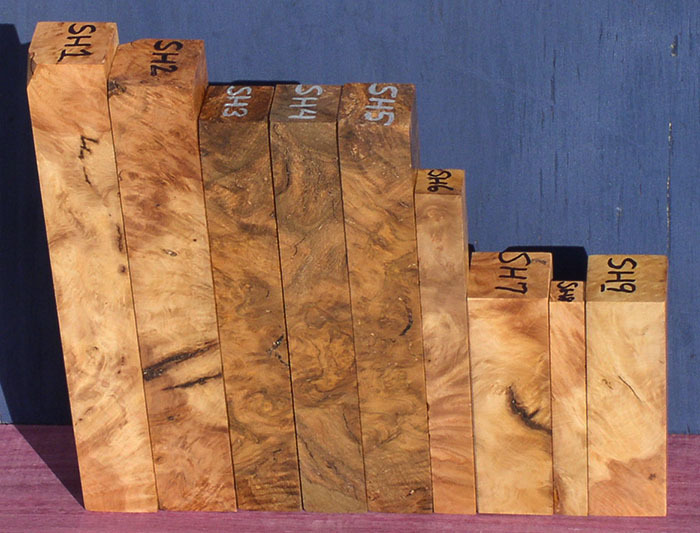 We have ceylon satinwood too, email us. Pyinma has much better figure. Sample of gallery grade plus figure We are drying some pyinma now (6/2018) and will get it on here asap. Ash grows widely in the eastern half of the USA. 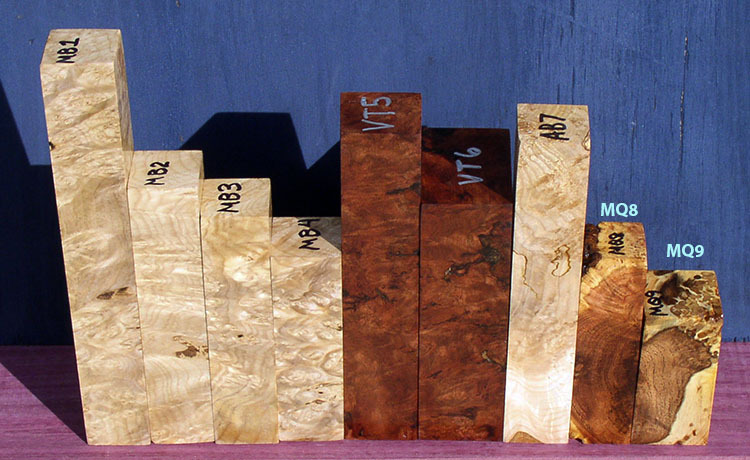 Burls do occur, but rarely have the concentration of eyes as seen in those sold below. 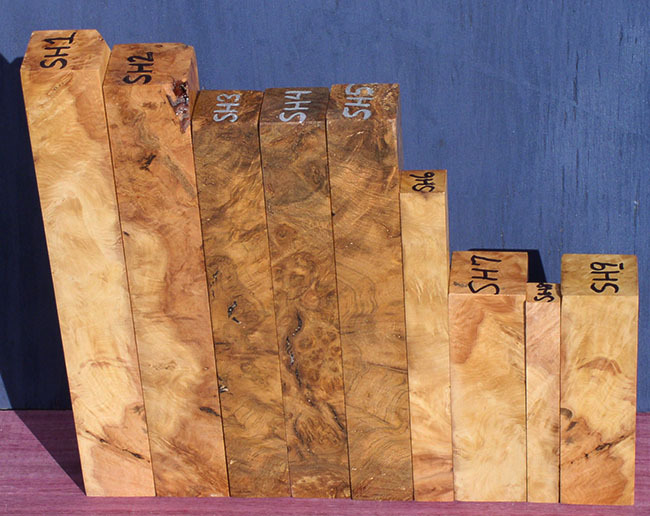 These were professionally stabilized by kiln drying and then forcing clear resin through the wood at very high pressure. 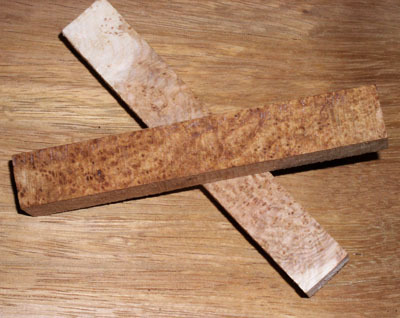 This results in a stable blank that tends to warp much less then un-stabilized wood. 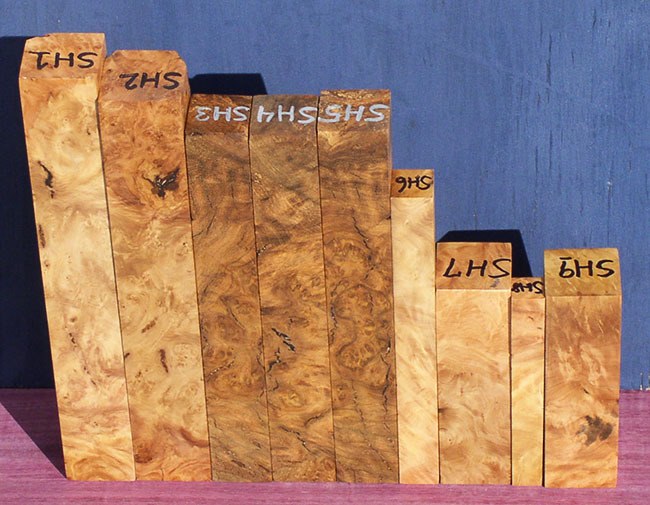 We don't expect this wood to be in stock all the time, but occasionally.